Raw banana or vazhaikkai is used in south indian cooking in many ways. Last week one day was ammavasai or no moon day. Vazhaikkai is a must dish during this day. 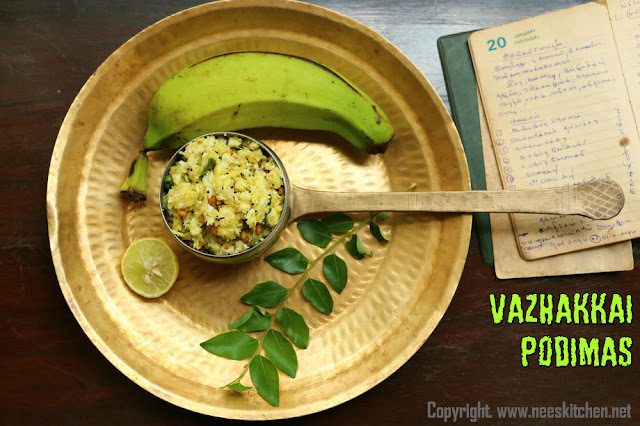 There are various ways to cook this dish and podimas is a simple and healthy recipe prepared with vazhaikkai. It consumes very less oil and using microwave is a much quick and easy way to prepare this dish. 1. Chop the head of raw banana. Microwave the raw banana for 4-5 mins. It might slightly give a burst sound , it means that it is just opening up. 2. Take out and leave it aside to cool. Remove the skin and grate. 3. Mix turmeric, hing powder and salt. 4. Take a pan add items given in “To temper” table in the order given. 5. Once cooked, add the grated raw banana and mix it well. 6. Switch off the gas and add coconut and squeeze lemon. 7. You may garnish with coriander at the end. Raw banana can be boiled in water instead of microwave. Gas must be switched off before putting coconut for better taste.